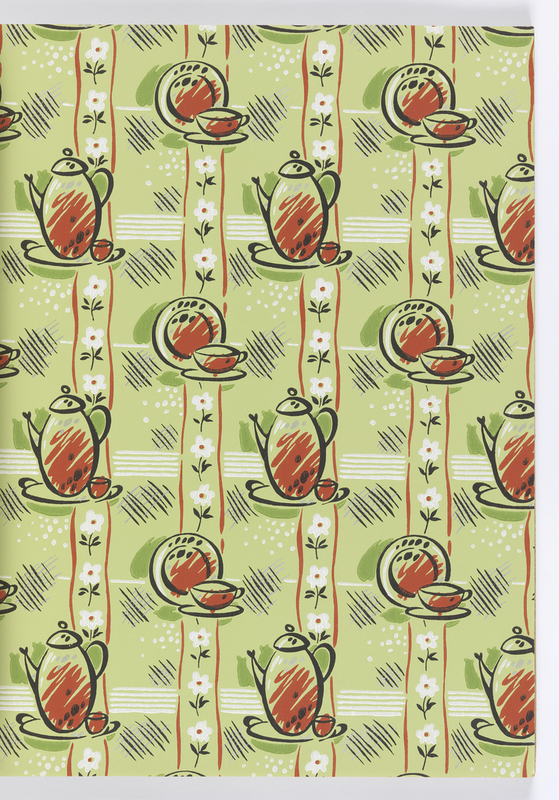 I have always enjoyed seeing this kitchen paper with its coffee pot, luncheon service printed over the fun plaid background pattern. It is just so perky and the use of complementary colors and gestural strokes give the design a nice energy and keep it from feeling stagnant. Printed in 1948, it still looks modern today. The objects are rendered with the appearance of quick sketches with splashes of color brushed in, not really staying within the lines. Very 1950s! While the strict repetition of objects over the plaid ground gives the design a sense of formality, the loose illustrative nature of the design helps maintain a very casual feel. Kitchen papers gained popularity with the introduction of washable papers in 1934, technology patented by Imperial Paper and Color Corporation. Prior to this innovation wallpapers were printed with water soluble pigments which meant they couldn’t be cleaned. To help hide dirt, manufacturers printed special papers with mottled surface designs for areas likely to be soiled, such as kitchens and children’s rooms. Another option for a surface that could be wiped clean for high traffic areas were varnished tile papers or printed oil cloths. This is one design from a sample book containing a mix of trendy and traditionally styled wallpapers. The samples also include designs of cowboy and Indians and astronauts, to give you a better sense of the variety of samples available. Sample Book page, Charter Oak Decorations, 1948; Machine-printed on paper; Museum purchase from Friends of Wallcoverings Fund, 1995-87-2.